This episode's News & Views includes the latest stories and research about America's declining life expectancy data, how optimism may extend life, and the latest archaeological clues about the Paleolithic Diet. The Moment of Paleo segment offers ideas about how to think about longevity in the context of your own health goals. And the After the Bell segment offers more longevity food-for-thought from Neil deGrasse Tyson and Laura Carstensen. Links for this episode: to shop for eco-friendly clothing and stand-up paddle boards. Be sure to use coupon code "latest in paleo" for 15% off all clothing purchases. On this week's episode we start with a message from Stephen Hawking . Then, it's News & Views featuring new research about exercise's affects on the brain; details about physical activity levels within the Hadza hunter-gatherer tribe; and how being in nature benefits human beings. The Moment of Paleo segment offers food for thought about overthinking, and After the Bell features a neuroscientist's insights on exercise and creativity. Enjoy the show! Links for this episode: to shop for eco-friendly clothing and stand-up paddle boards. Be sure to use coupon code "latest in paleo" for 15% off all clothing purchases. This week's episode of Latest in Paleo features News & Views on the latest energy drink research and an energy drink case that may have put one man in the hospital; new research suggests alcohol consumption may help prevent strokes; and why researchers believe yo-yo dieting and weight regain could be related to alterations in the gut microbiome. The Moment of Paleo segment offers food for thought about how measurements color our perceptions. And the After the Bell segment features a Socratic dialog about reason and morality. Links for this episode: to shop for eco-friendly clothing and stand-up paddle boards. Be sure to use coupon code "latest in paleo" for 15% off all clothing purchases. On this week's holiday episode our News & Views segment starts at Krispy Kreme to see if we can extract any good take-aways from the recent class-action lawsuit filed against the chain. Then, it's on to a recent study about what happens when you don't feed your gut bacteria...what do they eat instead? The segment is rounded out with coverage of recent research on whole milk for kids and a new—somewhat strange–non-pharmaceutical weight-loss pill. 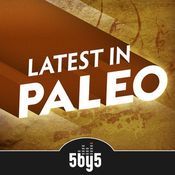 The Moment of Paleo segment offers thoughts on restriction and upcoming holiday feasts. And After the Bell features a talk about life's invisible feast. Enjoy the show! Links for this episode: to shop for eco-friendly clothing and stand-up paddle boards. Be sure to use coupon code "latest in paleo" for 15% off all clothing purchases. On this week's News & Views we cover: NSAIDs like Ibuprofen, Celebrex, and Naproxen; new research that suggests high HDL is not heart protective; and how worrying about health can actually affect your health. The food for thought continues in the Moment of Paleo segment, which explores the things we cannot do when we must do them. After the Bell features a talk by Alan Watts on the topic of Double Binds. Links for this episode: to shop for eco-friendly clothing and stand-up paddle boards. Be sure to use coupon code "latest in paleo" for 15% off all clothing purchases.